Wild Digital - Etch film - translucent self adhesive window film. Etch film is an easy to apply self-adhesive vinyl ideal for mid to long-term window decoration. When etch film is applied it gives the appearance of frosted or etched glass to windows and renders the glass opaque. Whether for privacy, to obscure an unslightly view or to update your interior, etch film is the best material for you. It will work on any smooth glass surface including double glazed units and can be used anywhere in the house or office. 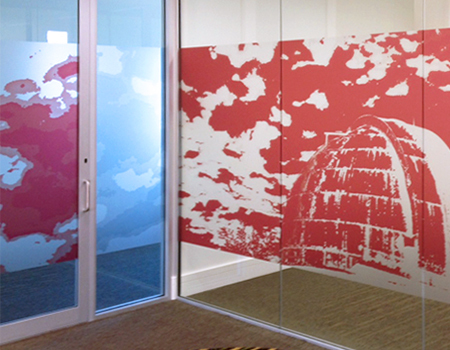 Printed Etch film for your office or home renovation. 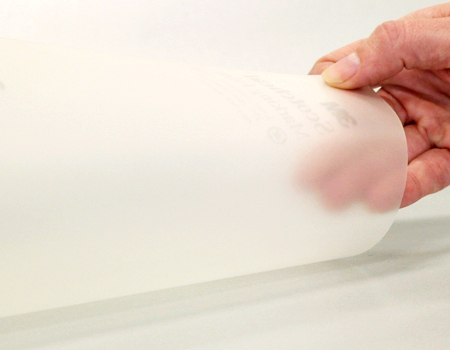 Etch film uses are only limited by your imagination.We can digitally print etch film with any image. Use it to produce a stained glass effect or a Victorian style design on your entry door or window. Try a church-like mural or funky designs and shapes to go on a window in your children’s play room. 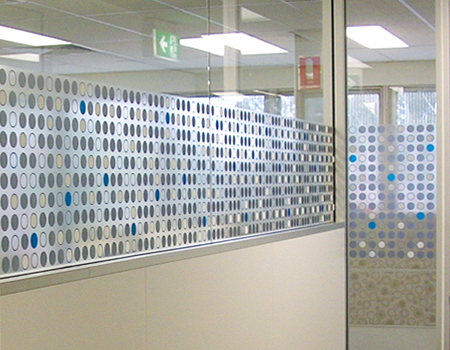 One of the best uses for etched film is to create a privacy screen in office environments. It can be applied to the windows of office conference rooms to create a good balance between gaining privacy and retaining natural light.